It’s time to start using both my blogs again. I thought I’d start with disappointing Poll Everywhere news. I discovered a 25 response cap in class during an activity (a histogram of coin tosses) where I was asking for 50+ responses. 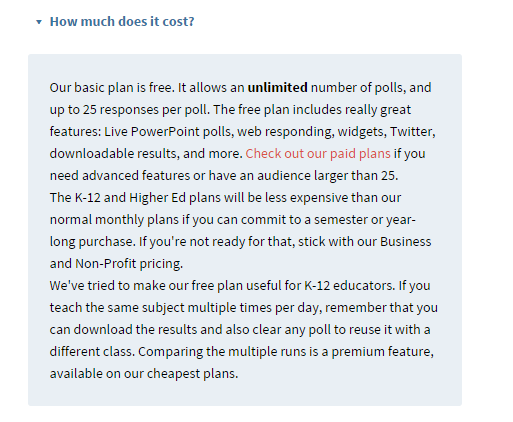 I may have to search for a new in class polling software as I find the pricing more than I think it is worth. The next plan is $19 per month for 50 responses. Then it jumps to $79 per month for 100 responses (and other features) so others may consider it. I tried kahoot (kahoot.it for users getakahoot.com for teachers). It is basically bar trivia for the classroom. In a math classroom it causes a problem. Often you want to students to thoughtfully think about an answer. But, the points are dropping away as students compute. An instant answer is worth more than an answer at the end of the time limit. So, some students play to win the game by answering quickly instead of thoughtfully. You can change to a no point format. But, that ends the game aspect. Nonetheless I think I may use this occasionally for polling and I will make them no points questions. I considered a third software program (Answer Pad) I learned about at the MichMATYC conference, but after creating an account it was not clear how to use the software. I was trying to pre-create slides for a class and could not figure it out. The first help video was not helpful for me and so I decided to invest my time elsewhere. They did send several emails suggesting that I use the software and help features, but they gave up after a week or so of inactivity. I may revisit it some day as so many people seem impressed with this.